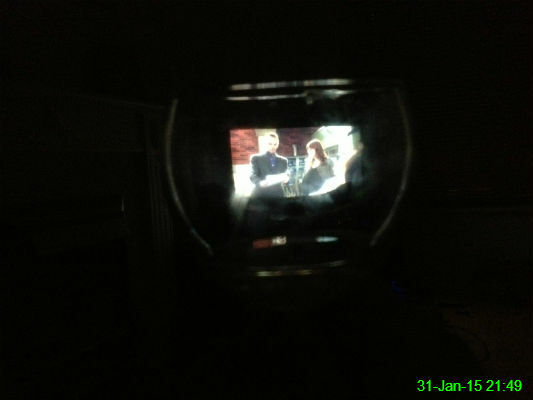 My attempt at being arty: an episode of Elementary through a wine glass. It's probably not going to win any prizes. I waited (sort of) patiently for the bus on the left to come into service while another one slowly nudged past. This takeaway leaflet makes no mention of delivery so presumably I'd be expected to collect from the restaurant. 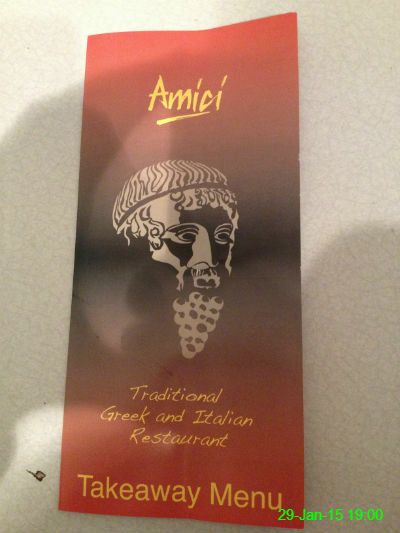 They should hire a delivery driver who looks like the bloke on the front of the menu because I'd tip him for having a beard that resembles a bunch of grapes. 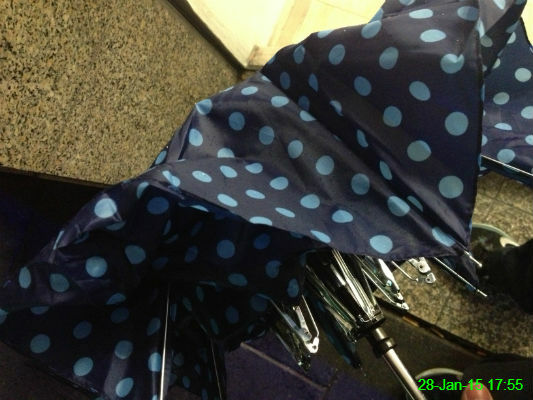 This is without a doubt the worst umbrella I've ever owned. I left quite a sturdy one in the back of a taxi so bought this one for a few quid from Morrisons and after two uses I'm ready to fly into a fit of rage at how utterly pathetic it is. 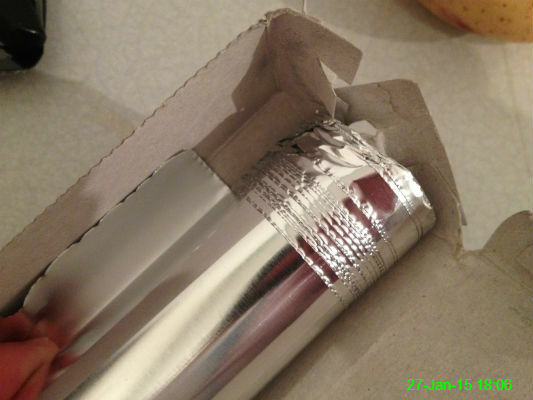 My foil hasn't been coming off the roll properly. I didn't do anything to sort it out today, but I suppose I'll have to soon otherwise I'll end up with a tiny strip. 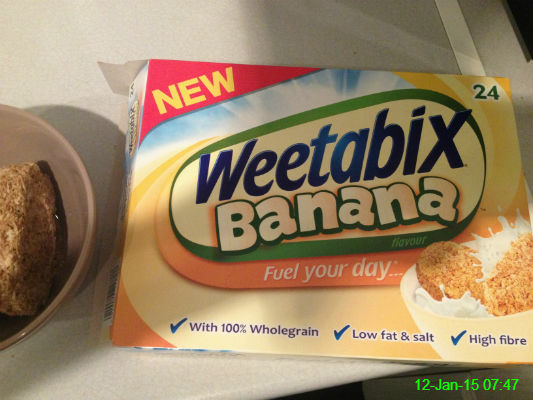 I hate these so I made Ali do it for me yesterday. 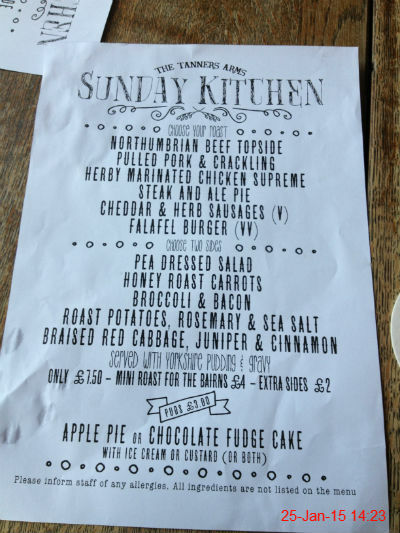 I wasn't sure about this Sunday dinner menu at the Tanner's. Having to pick your side dishes separately is a bit of a messy way of doing things, if you ask me. Which they didn't. Also, the dressed pea salad? Just peas. 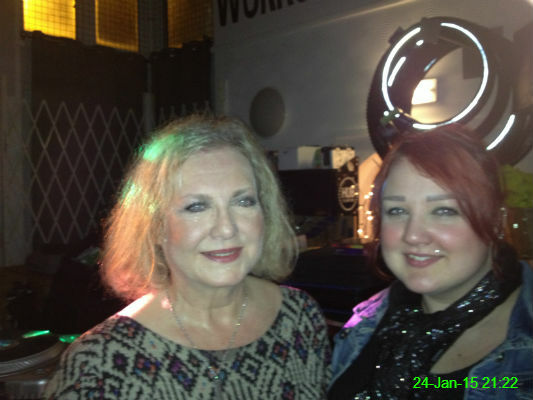 I love this photo of Auntie Sue and Ali that I took at Sophie's 30th party because they have exactly the same set of eyes! We went to Cafe 21 for the latest Restaurant Week. where they were doing three courses for £20. 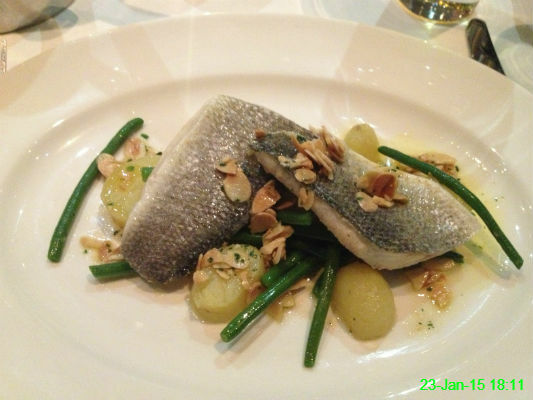 This was my sea bass main course, which was very tasty. 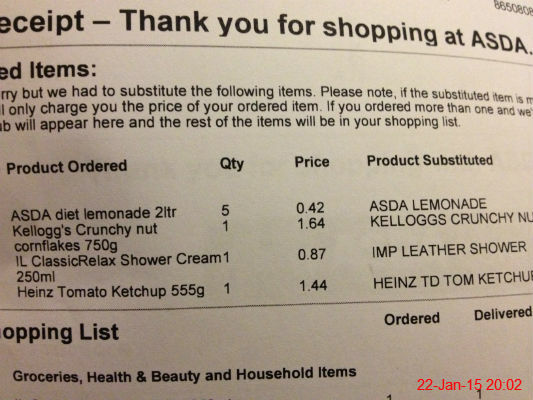 I think Asda staff need to use their heads when substituting. Instead of the diet lemonade I asked for, they sent normal lemonade and instead of the reduced salt/sugar tomato ketchup I ordered, they sent normal ketchup. I know they can't necessarily predict what people will be happy with when selecting a substitute, but I would've thought sticking to diet or healthier brands when they've been ordered was a no-brainer! 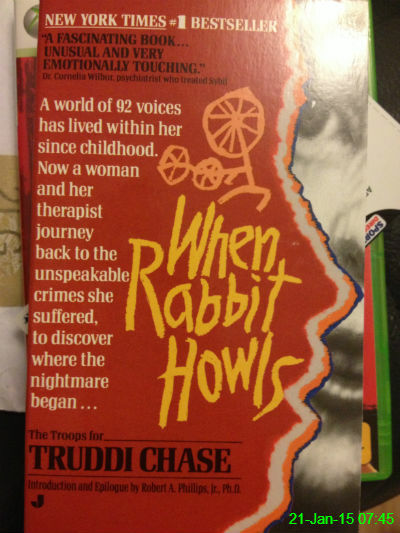 This was one of my shortlisted selections for the book club which didn't get picked during my month. I've decided to read it anyway since I've been meaning to get round to it for ages. So far I've only read the foreword and I suspect it will be a difficult read, but hopefully an interesting insight into multiple personalities. Well, I had to buy a souvenir yesterday, didn't I? 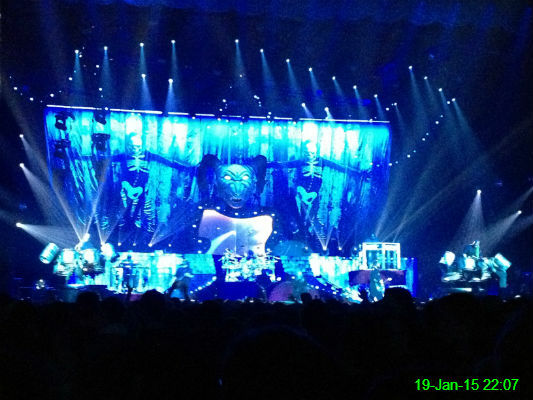 I can never resist a heavy dose of nostalgia so when I heard Slipknot were playing Newcastle Arena, supported by Korn, there was no chance I was missing out! I hadn't seen Slipknot before and thought they were very good live. 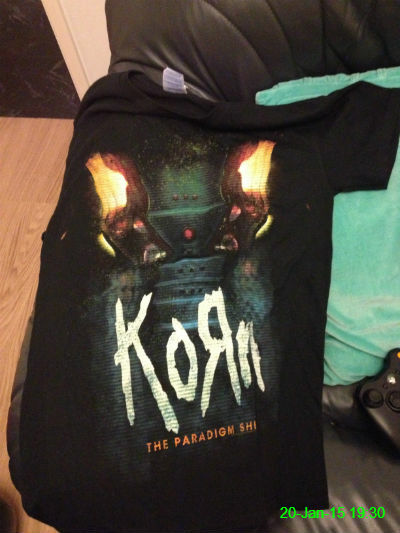 And of course Korn didn't disappoint! 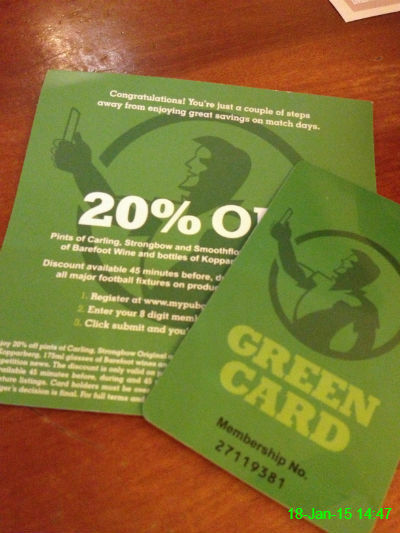 I found myself with one of these after calling into The Plough for an hour or so. It means reduced price Strongbow, so I guess it must be a good thing. 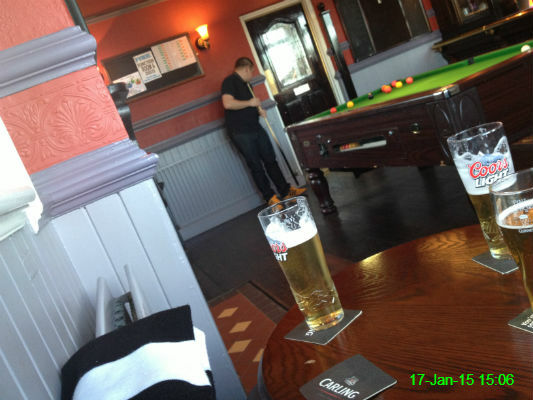 This week we spent a few pre-match hours in Burradon and played some pool. 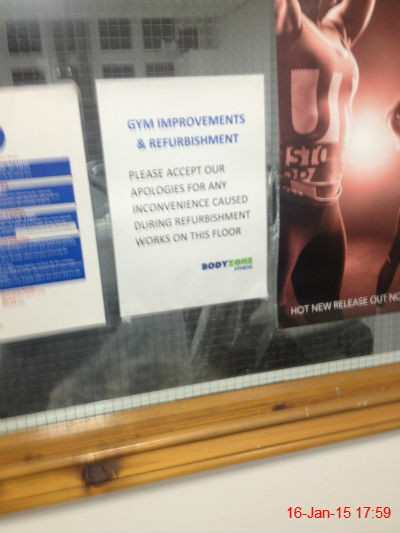 This is a blurred photo of a sign saying the gym is being refurbished. 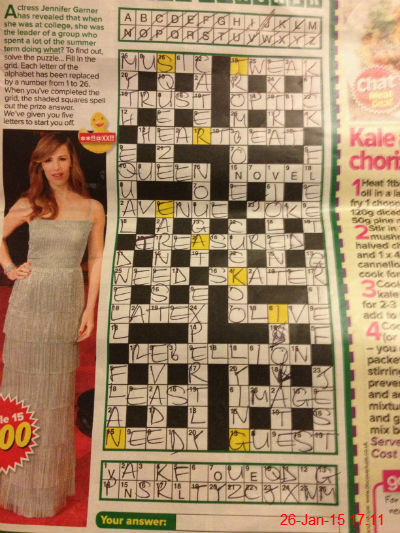 It was the best I could muster on a boring, cold Friday. 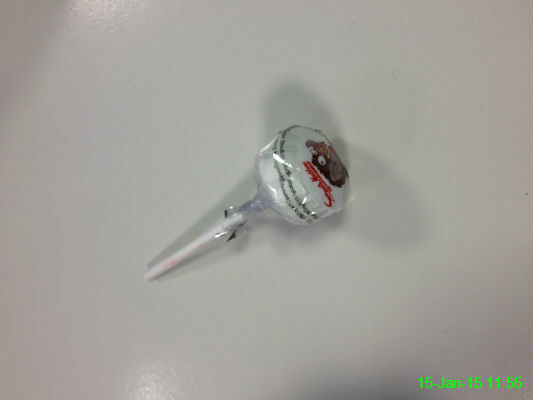 It's been a while since I had one of these lollies, but I couldn't resist today! 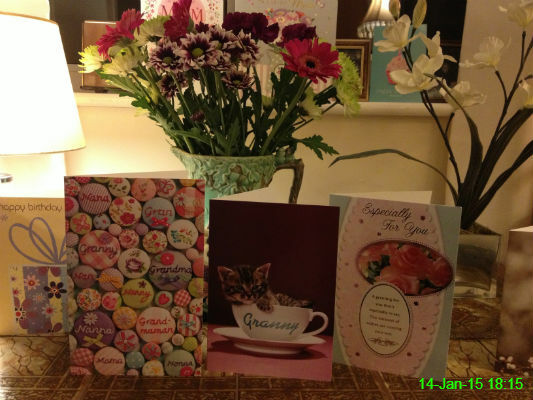 Gran turned 92 today so here is a selection of her cards. I got her the cat in the teacup with 'Granny' on it and the flowers in the vase behind. 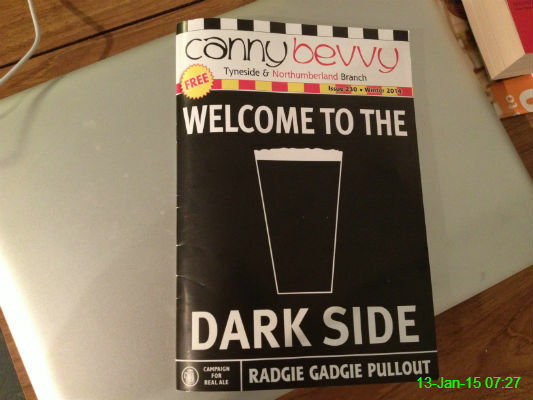 I pick this free magazine Canny Bevvy up occasionally so I've got something to browse over breakfast. This one is a Radgie Gadgie special. I bought this for the first time over the weekend. It's lovely! 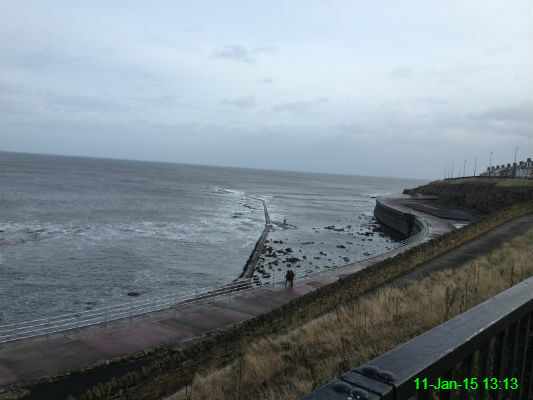 It was so windy I felt like I was going to blow into the sea as we walked along the coast. Massive respect to the brave soul who was standing in the sea fishing! This is the latest choice for my book group. 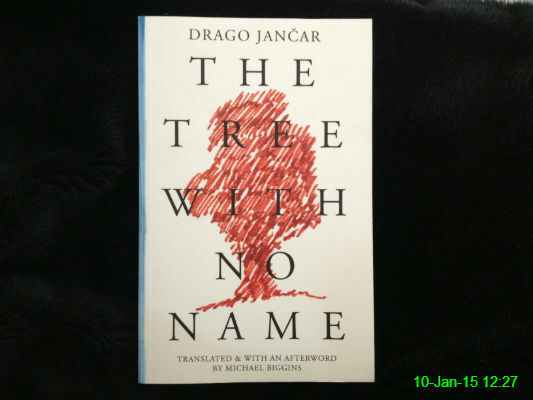 I've never read any Slovenian literature before so this will be a completely new experience. 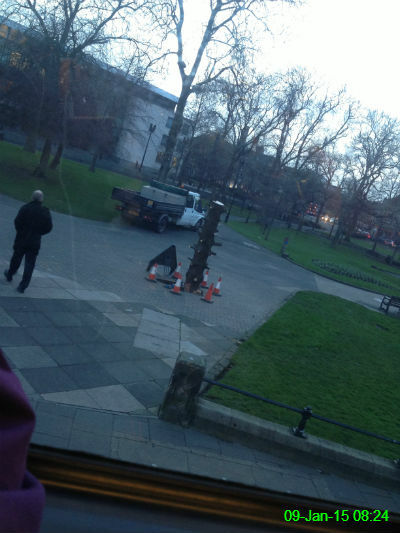 I couldn't help feeling a bit sorry for this tree with all its branches chopped off. I'm not sure why the cones are needed. Is it to keep the tree in, or people out? 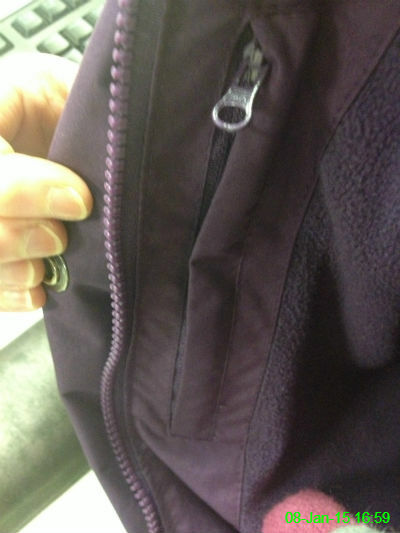 I've had this coat for well over a year now, but today I noticed this inside pocket for the first time. Despite never knowing of its existence, naturally I still checked to see if there was any money in there. Unfortunately.. there was not. 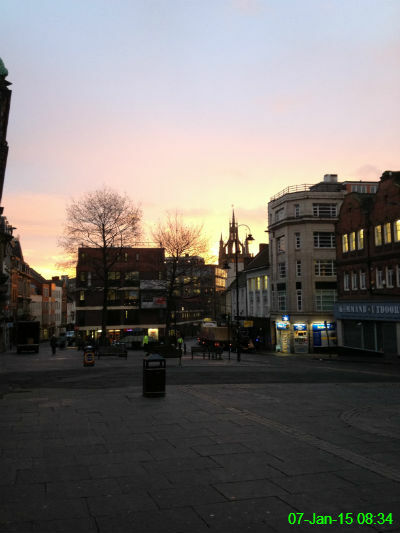 Another sky shot - this time sunrise over the Bigg Market. Not exactly what you'd consider a classic. I don't think an iPhone is the best way to capture what looked like a brilliant shot, but I was amazed at how big the moon looked tonight and how low it was in the sky. 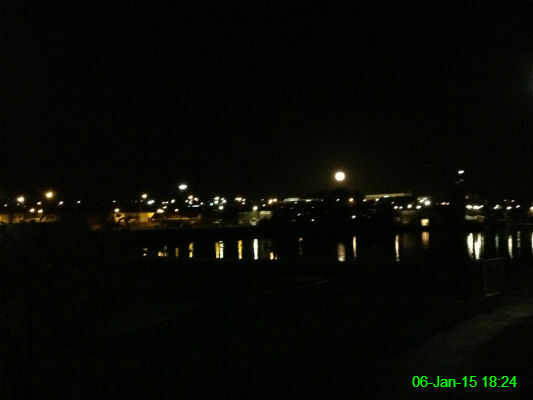 Now I've taken the photo, it just looks like a very bright streetlight. 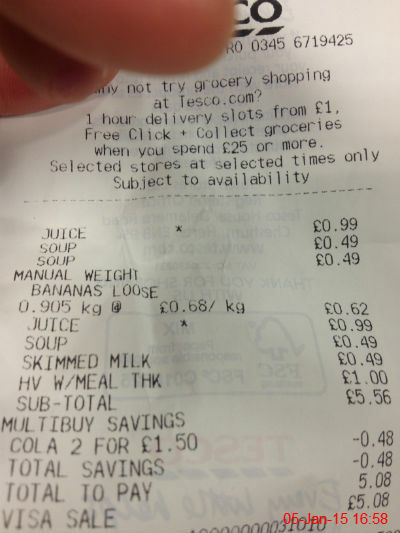 I went into Tesco on the way to work this morning to get a few basic supplies for home and work. I'm impressed with the 48p I've managed to save. 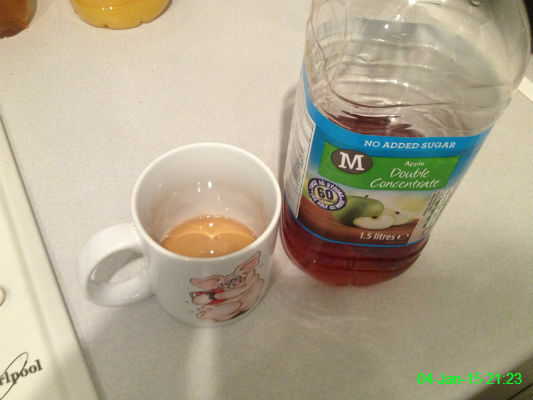 My new addiction is hot apple juice, which involves waiting impatiently for the kettle to boil. 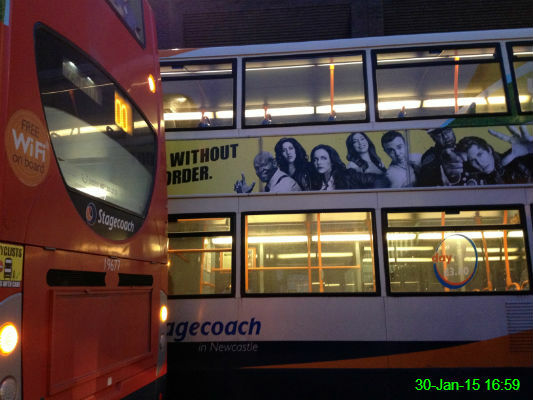 3 January 2015: He's Gone! I've been waiting for this to be confirmed all week so I was over the moon to see Sky Sports News finally state that Alan Pardew has left Newcastle to manage Crystal Palace. BYE! 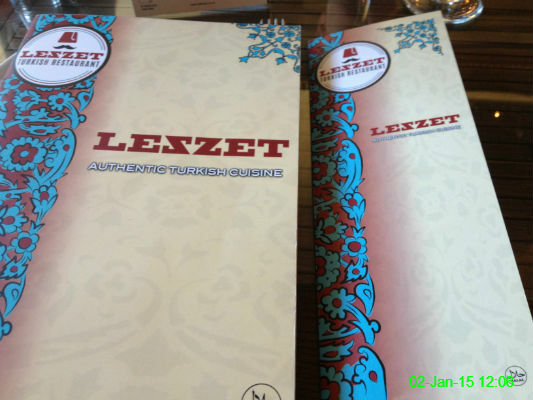 We went for a family meal at a new Turkish restaurant, Lezzet, to celebrate Nasser's birthday. The food was outstanding and I'll definitely be going back. 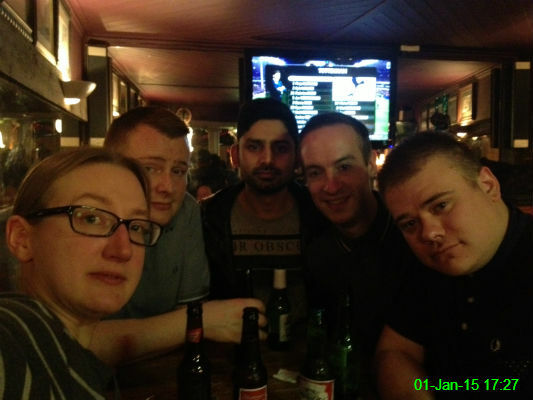 I was joined by James, Mak, Matty and Michael as we braved our hangovers to go and see Newcastle draw 3-3 with Burnley. Naturally, we ended up in Rafferty's, where I proved that you don't need a "selfie stick" to take a good photo.